In Ohio, lawmakers are now poised to outlaw traffic safety cameras, needlessly obstructing efforts to save lives. Similar bills were taken up this year in statehouses in Iowa, South Dakota and Missouri. According to the Governor’s Highway Safety Association, 12 states have laws that forbid speed cameras under most circumstances. If enacted, these laws will certainly end up costing a lot of innocent people their lives. A 2010 review of dozens of studies indicates that speed cameras always have a positive effect on street safety, typically reducing fatality rates by around 30 to 40 percent where they are installed. One of the most impressive case studies, on a national scale, is France. Since the French government began its crackdown on speeding about a dozen years ago, annual traffic fatalities have been reduced by more than half, from 7,242 in 2002 to 3,250 in 2013. That is more than double the rate of improvement in the United States over the same period. Researchers attribute a major portion of that reduction to the installation of about 3,000 speed cameras across the nation. Following the adoption of a new set of street safety policies by President Jacques Chirac in 2002 — including stricter penalties for traffic violations — and the installation of cameras in 2003, enforcement of speeding increased dramatically, from about 100,000 tickets per month to about 500,000. About 87 percent of those citations were issued by cameras. In a 2012 study in the Journal of Accident Analysis and Prevention, researchers set out to determine how many deaths and injuries were prevented by France’s wide-scale adoption of automated speed enforcement, developing statistical models to isolate the effect of the cameras. In the first two years following implementation, they estimate that speed cameras prevented 4,498 fatalities. The improvement had staying power. Over seven years, the authors attribute the cameras with saving 15,193 lives. An additional 62,000 non-fatal injuries were avoided as well, according to the study. In France, speed cameras had popular and political support. Study authors Laurent Carnisa and Etienne Blais note that even the French media generally supported automated enforcement — in contrast to American media outlets that often seem more eager to exploit motorist resentment than to convey the public safety benefits. The takeaway from France is that powerful tools to prevent traffic deaths are at our disposal and can be put to use almost immediately, if our elected representatives can muster the will. Don’t see a link there showing where that data comes from. As such it can’t be evaluated for its accuracy. If you find it absurd, then you don’t understand much about traffic engineering and how roadways can be made less safe when drivers are forced to hyperfocus on one aspect of driving, or the concept that speed variability results when you try to force drivers to travel at speeds lower than what the roadway is designed for. Variability of speeds on a roadway has been shown to increase collisions. The MTA is not installing red light cameras to make money. Frankly they don’t care if there is any profit in it. The whole idea behind installing cameras is to reduce the number of collisions. If the cameras are effective, then the number of violations will significantly decrease and any profit will likely disappear. The first 14 miles of the Orange Line had red light cameras installed after there were incidents with motor vehicles running red lights. The installation of cameras significantly reduced the number of red light violations. Therefore, the safety improved. I’m probably much more intimately knowledgeable about the effects of red light cameras along the Orange Line than you are, since I’ve ridden a bicycle along the path next to it hundreds of times and ridden the bus hundreds of times. It’s fairly easy to see the effects on car driver behavior from having the red light cameras. Go to an intersection nearby without the red light cameras and driver behavior changes quite noticeably. Sorry, it’s not my job to provide this info. You are making the assertion, so it’s up to you to show that what the author states in the article is not correct based on the report he cites. Again, your belief is not evidence. I’ve mentioned five countries which have much lower fatality rates than the U.S. and each of them employ speed cameras. Another country mentioned is Denmark. These countries have some of the lowest rates of traffic fatalities in the world. All of them showed success in managing driver speed by using speed cameras. 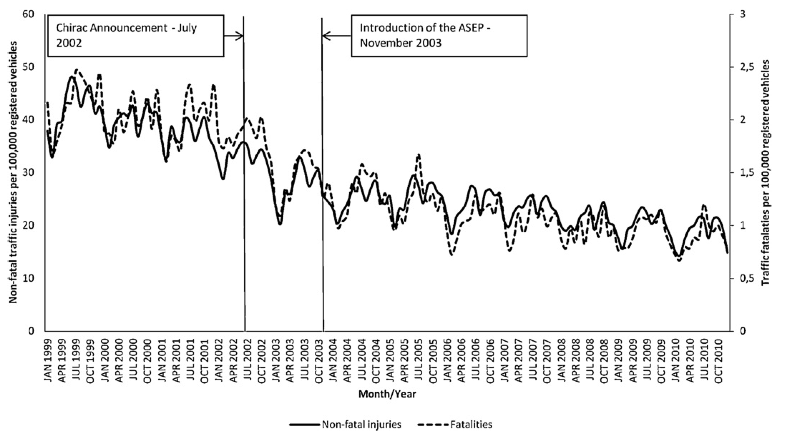 Its quite clear that if there an impact at a lower speed the odds of serious injury is reduced. These countries seem to disagree with the simplistic conclusion that speed cameras could make it less safe. Speed cameras are one of the tools that these countries use to reduce traffic fatalities.. Meanwhile you go on and on about how you believe its motivated by profit. That’s simply not the case with the MTA. If anything they lose money on red light cameras if they are effective in reducing violations. How are they making money on intersections with cameras that only get 2 red light violations a month? >How would you encourage Angelenos to use transit? Clearly, everything you advocate for is to make driving more miserable so everyone has to use your chosen mode of transportation. You're not really interested in reducing the speeds of the most egregious violators in order to improve safety, you want to reduce all private motor vehicle speeds so, in your words, using a car is "more inconvenient". That's what this is really all about for you. You've been forced to give up your car and now you want to make everyone's transportation experience as miserable as yours is. All that red light or speed cameras do is automate the process of issuing traffic tickets instead of having law enforcement do this occasionally manually. It can be done more accurately and quickly with automation. So then, you must have the same view against law enforcement officers issuing tickets and perhaps you also believe that officers issuing tickets is done mainly for making a profit. That was a chapter out of a report. The report he cites doesn’t give any information at all about speed cameras. The author draws his conclusion from that report with exactly the same amount of evidence that I used to describe how the opposite conclusion could be drawn: zero. No that’s not all they do. Your statement makes it clear you do not understand all the issues having to do with automated enforcement, why it’s different from having an actual police officer issue tickets, and why the profit motive of the for-profit companies and the jurisdictions that employ the ticketing systems corrupts the process. I don’t have have time or inclination to school you on this, especially since it will fall on deaf ears. You clearly have an agenda to make driving a personal vehicle “more inconvenient” (your own words) in order to force people to live their lives like you want them to with less choices in their personal lives. That’s inconsiderate, petty, and arrogant. If you actually wanted to have an honest discussion about these issues I’d be happy to do so but it’s clear that you’re not interested in that because you’ve decided that driving a car is bad and anything that makes that experience worse is good, regardless of the benefits or lack thereof. And on top of that you take the holier-than-thou attitude that you’re about preventing injuries when in fact it’s really about pushing your anti-car agenda. And again, you create a straw man argument by declaring what I must believe in which isn’t at all what I actually believe. You have repeatedly mischaracterized my position on a number of issues so you can argue against that rather than deal with the actual substance of the points I’ve made. It’s too tiresome to deal with that kind of nonsense so I’m going to exercise my personal right not to engage with you anymore. How do you jump to the conclusion that creating safer roads by using photo enforcement cameras will make driving more miserable? You mean countries such as France, Denmark, the Netherlands, Finland, Sweden and Norway that have a much lower traffic fatality rate than the U.S. therefore have a higher percent of miserable drivers than the U.S.? You also seem to, by that reasoning, believe that those who make trips by walking, bicycling or taking transit are more miserable than drivers. I want to reduce all motor vehicle speeds to make driving less convenient? Where have I ever indicated that? You state “Clearly, everything you advocate for is to make driving more miserable so everyone has to use your chosen mode of transportation.” Boy, is that jumping to conclusions and a generality. Everything? Really, everything? That sure is a all inclusive statement. In fact I’m not trying to force anyone to choose any mode of transportation that I do. I’m against favoring driving a car in a city during peak hours when the roads are at capacity and no more motor vehicle lanes are being created to accommodate more of them. Or that making driving less convenient as most of those countries the I mentioned have done is going to by necessity make the drivers miserable. When there is not enough space to handle all of the cars during peak hours, then what do you do? I got it, encourage everyone to drive during those hours by making it as convenient as is possible. Yep, that’ll make each one of them much less miserable when they are stuck in a traffic jam. Caltrans has for years used traffic signals at the top of freeway on-ramps to regulate how many motor vehicles are on the freeway at one time. That inconvenience enables the traffic on the freeway to keep moving. If those freeway on-ramp signals were removed, the traffic on the freeway would come to a halt for much longer periods of time during peak hours. The freeways would essentially become a big parking lot. You have no idea whether I own a car right now. Again your jumping to conclusions. I must say that at least I’m not afraid to use my own name on this blog post unlike you. Let me see are VoiceofReason, PhotoRadarscam and Banthecams all the same person. Notice the similarity in using three words strung together. Was that done to make people believe that there is more than one person against photo enforcement on this blog and perhaps pushing an agenda? That could very well be. Hard to tell since these are anonymous names that anyone could be hiding behind. Q: How would you encourage Angelenos to use transit? This shows your bias against the use of personal automobiles. You are in favor of making car driving slower, not for the sake of safety, but because you want it to be more inconvenient than using a bicycle or transit. I will repeat that that attitude is inconsiderate, petty, and arrogant. I’m not jumping to conclusions. I’m just reading your own words. A person using the name “Voice of Reason” is accusing someone else of having a holier-than-thou attittude on this blog. That’s pretty funny. You seem to be inferring that traffic officers cannot be corrupted or won’t be asked to write more tickets by superiors since your only focus seems to be on the potential corruption that enforcement cameras might bring. There are lots of private companies that public agencies or government does business with. Since there is a profit motive with a private company, therefore there has to be corruption seems to be your logic. Or that by using enforcement cameras this therefore has to corrupt the process. I’m sure you can give instances where this has happened and I can also give examples of where a police force was corrupt. This does not mean that in all instances this is the case. It seems to be another example where you draw general statements that are all inclusive. A horse has a tail, therefore all animals with a tail are horses. “You clearly have an agenda to make driving a personal vehicle “more inconvenient” (your own words) in order to force people to live their lives like you want them to with less choices in their personal lives. That’s inconsiderate, petty, and arrogant.” That’s pretty hilarious. Boy, can you jump to conclusions. You go on about how I want to force people to live in a certain manner with less choices. Actually, I want people to have more transportation choices and not less. I also don’t want people to be maimed or killed from drivers speeding or running red lights. Where in those statements that I made quite a while back does it infer in any way that I want to make “driving slower but not for the sake of safety”? Your at least consistent in jumping to conclusions. Could it be that a person stating that they want to make car driving slower and less convenient could be advocating for increased safety and moving more people in a fixed amount of space? Or that an abundance and convenient supply of parking spaces could be encouraging people to drive during peak hours when there aren’t enough motor vehicle lanes to accommodate an ever increasing number of drivers. Brian Taylor, UCLA professor of Urban Planning, recently stated that there are three ways to get rid of congestion. Pricing the use of the roadway, putting restrictions on use, or constructing a massive amount of additional capacity. There is another way and that is to motivate people to use other forms of transportation that take up less space to move each person during peak hours. Walking, bicycling and transit all need less space to move people compared to cars. Again, you're putting words in my mouth. I never said “in all instances this is the case”. It is the case in all instances that I have seen (and I've seen most if not all of them). And I know you will disagree about the MTA, but you'd have to look at the full history of the program and what they have refused to do that would have reduced the number of violations to truly understand what's going on with that program. And riding the bus and a bicycle on the busway isn't going to provide you with the requisite information you'd need to fully evaluate this. Could the automated programs be designed in such a way as to ensure they are only used to catch the egregious violators that are actually causing the problems on our roadways? Sure. But to date they haven't been. They can't turn a profit under those conditions. As soon as the programs start losing money (in many cases because some engineering countermeasure was employed that reduced violations), they are abandoned. So to be clear, I think automated enforcement run by for-profit companies more often leads to more tickets being written in order to raise revenue. That's specifically how the systems are marketed. So in addition to the inherent problems that can arise with live officers and their superiors, with automated enforcement you have an additional player in the game whose main motivation is profit. The way they can maximize that is by encouraging (or in many cases dictating) the employment of cameras in places where they will turn the most profit, not where they are needed most for safety. And they have to cast a very wide net to ticket as many people as possible (not just the outliers) to justify the high cost of the systems. That's the inherent problem when you allow private companies to co-opt the police power of the state. In addition, these companies employ teams of lobbyists to write laws that are favorable to their interests and often times detrimental to the interests of the people and safety. There are numerous examples of these companies lobbying to stop jurisdictions from employing engineering countermeasures that would actually cut the number of violations and tickets. They don't want those countermeasures used because they cut into their profits. And the more money they have, the more influence they can hold over our government. None of that is a good thing. A: Make using a car slower and more inconvenient than a bicycle or transit. That's where you say you want to make "driving slower but not for the sake of safety". You say you want to make driving slower to encourage Angelenos to use transit. The clear inference is that you want to make using a car slower and more inconvenient to encourage Angelenos to use transit, not for the sake of safety. Could you also want roadways safer? Sure, but you clearly want to slow traffic mainly for the purpose of making it more inconvenient to drive a car so people will be forced to use other forms of transportation. Let me see if I can explain my objection to your approach this way. A kind, thoughtful person who truly cares about their fellow beings looks at the situation and says, “Walking, bicycling, and transit all need less space to move people compared to cars (although walking and bicycling are generally less efficient at most times and transit is limited to predetermined times and locations so it doesn't work for everyone). I'd like to see people use those forms of transit more often. Let's see how I can make those opportunities more abundant and efficient so people will choose them more often.” An inconsiderate, spiteful and arrogant persons says, “Let's see how I can make cars less convenient so people are forced to use these other forms of transportation.” Do you see the difference between the two approaches? Based on you previous comments you're the second type of person. I, on the other hand, don't want to see anyone inconvenienced so I prefer the former approach. You are here on this forum advocating for the use of speed enforcement cameras, knowing full well how they can be abused and ignoring every piece of evidence that they may not be particularly effective in promoting safety. Why? Because for you, the goal is to make cars more inconvenient by forcing them to go slower. You want that to happen so people will choose other forms of transportation that you prefer for them. You specifically said that. So even if the cameras don't actually make the roadways safer, it would seem you're ok with that as long as they make driving slower and more inconvenient. According to your previous statements, that's your ultimate goal, not just to improve safety. Tough to win an argument with people who don’t drive (probably can’t afford to), but you make a great point about being hyperfocused on speed. It’s more dangerous to constantly be trying to maintain a steady speed to avoid receiving a ticket than paying attention to the conditions around you and driving accordingly. This is especially true at lower speeds, but again, people like Dennis don’t understand traffic engineering and simply believe everything the government tells him. Dennis- there is no proof that speed cameras reduced fatalities. This is likely due to greater safety features in cars. Dennis- you obviously are not an engineer, and are probably a shill for camera companies, who care ONLY about profit, and could care less about safety. But, again, you don’t seem like someone who believes FACTS. The trend towards lower and lower fatalities and injury per VMT has been ongoing since about 1920. Everytime the government makes an intervention it is claimed that these interventions ‘saved lives’ when the reality is that the slope is either unchanged through the intervention or the rate of improvement declines. In the case above there is no noticible difference in the trend before or after the cameras visible to the ordinary reader until well after the cameras are introduced and the curve begins to flatten out. The trend seems rather intact and on-going. If any thing relying on the cameras has slowed the rate of improvement. Of course state funded intellectuals are there to do complex analysis on the data to make the claim that the intervention did something positive. Cutting all speed limits in half, only allowing the latest models of automobiles on roads with the latest required safety features, implementing more rigorous driver-training programs, putting age restrictions on elderly drivers, criminalizing all traffic violations and installing large speed bumps going into all intersections would also undoubtedly save many lives. I could rattle off live-saving initiatives all day and challenge anyone who disagrees with them as not valuing human lives as much as I do. The difference is these things would not generate near the revenue at such low cost to municipalities. Don’t fool yourself that it’s all about safety, and ask yourself just where is the line that demarks enough safety. Thanx for sharing your cool web page…content is so gud & unique its very helpful n informative too!! !